Johannes Kepler was a German astronomer who formulated three laws of planetary motion, which were indispensable in helping Isaac Newton discover the laws of gravity. He was also the earliest professional astronomer to support Copernicus’ theories regarding heliocentrism. Kepler also suggested more accurate and refined lenses for telescopes. An asteroid and one of the moon’s larger craters is named in honor of him. Kepler was born in Weil, Germany, in 1571. His father was a mercenary who abandoned the family when Johannes was young and his mother was tried as a witch when Kepler was an adult. Kepler attended the University of Tübingen and in 1597, he married Barbara Müller, a wealthy young widow. They had five children together, but only a few of them survived. 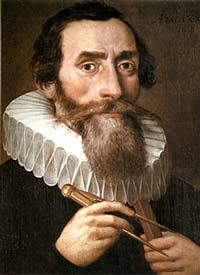 Following the death of Muller in 1611 , Kepler married Susanna Reuttinger. Together, they had six more children. Kepler accepted an offer to teach mathematics and other subjects at the Lutheran school in Graz, now in Austria. He took this teaching job even though he wanted to join the ministry. However, because he was pressured to convert to Roman Catholicism, he left Graz and the school and moved with his family to Prague. Some time before these troubles began, he met the Danish astronomer Tycho Brahe. Brahe’s influence on Kepler was enormous. Brahe even supported Kepler and his family financially for a while and made it possible for him to advance in his career through his political connections. Brahe was the most renowned astronomical observer in Europe at the time and he hired Kepler as his assistant. When Brahe died in 1601, Rudolph II, who was then the Holy Roman Emperor, appointed Kepler to be Brahe’s successor as the imperial mathematician. Kepler’s most significant discoveries came when he was searching for an orbit that fit all of Brahe’s observations regarding the planet Mars. Before this, astronomers believed that a planet’s orbit was a circle, or combinations of circles. Kepler simply could not find a circular arrangement that agreed with Brahe’s observations. Kepler eventually came to the realization that Mars’ orbit around the sun could not be a circle and was in fact an ellipse. The ellipse model worked and the theory that planets moved in circles, which had been in existence for some 2,000 years, was put to rest. Throughout his studies, Kepler was able to formulate three scientific laws regarding the orbit of the planets and their motion around the sun. His first law states that every planet follows an oval shaped path, or orbit, around the sun. This path is called an ellipse and the sun is located at one focal point of the ellipse. Kepler’s Second Law of Planetary Motion states that there is an imaginary line from the center of the sun to the center of a planet. As planets move along this imaginary line, they move faster when they are closer to the sun and slower as they are a longer distance from the sun. Thirdly, Kepler defined the time that it takes for a planet to make one complete trip around the sun as one period. His third law states that the squares of the periods of two planets are proportional to the cubes of their main distances from the sun. In his later years, Kepler became an adviser to General Albrecht von Wallenstein, for whom he drew up horoscopes. Wallenstein worked under Ferdinand II, who had succeeded Rudolph as Holy Roman Emperor. Kepler moved to Regensburg in Germany and died there on November 15, 1630.